Ensures ease of mowing from tractors. Ease of loader mounting and dismounting by one person with no tools required. Set on the front part of your tractor and operable with the rotary mounted, which ensures ease of work for long hours. Connecting to cabin tractors to provide more comfortable operating environments. Uses only a few attachments parts that can be assembled to cabin tractors in a short time. Possible to work from tractors. Furthermore, the front-mounting type provides good work visibility, and it takes 2.5 to 3 minutes to finish mounting the grass on a 100-meter-long dike. The mowing flat area at a speed of 2.5 km/h is as large as 1,700 m² per hour. Folding two-side rotary mower with highly efficient work. Adopts a hydraulic-driven two-side rotary mower, thus making it possible to mow the upper and slope sides of road shoulders and dikes. Four blades in total are provided to the upper and lower tiers to ensure powerful mowing. Provides a maximum horizontal work reach of 2.6 m, thus making it possible to mow slopes and remote areas. 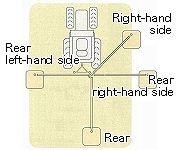 The mower can be set in three positions, i.e., the left-hand side, front side, and right-hand side. The arm is under the control of a single lever (PPC one lever) that is easy to use, which enables you to concentrate yourself on mowing work, thus reducing your fatigue. Bypasses obstacles with simple manipulation. 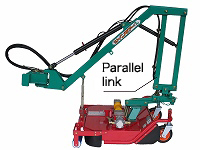 Incorporates a parallel link that can easily bypass trees and road signs by moving the front mower horizontally to the inner side. 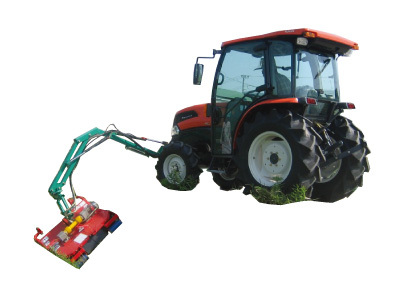 Mounted to your tractor with ease, thus increasing the operating rate of the tractor to play greater roles.